Laminar Jets, Fountain Design & Fountain Water Features. Spectacular dancing water and interactive water features. 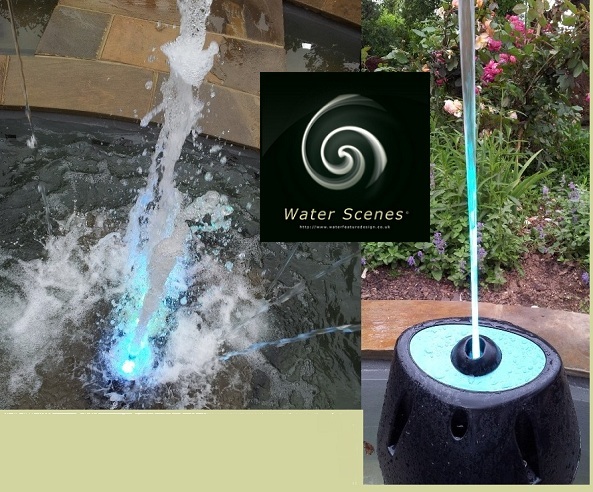 Water Scenes have the in house ability and resources available to design and construct fountain water features with fully programmable equipment such as jumping jets, rain curtains, LED lights (RGB) and much more. Modern fountain water feature equipment and underwater lighting advances have lead to a surge in the popularity of water displays and interactive features in modern urban and municipal landscapes. Fountain technology (laminar jets) have come along way in the past ten years and are now proving they can do more than ever here in the UK. Laminar jets are a type of fountain. They work by straightening the flow of water molecules to give it a glass like appearance. This is achieved by taking the turbulence out of the water. Add LED lighting and there you have it, limitless fountain design possibilities at your control. For more info on Laminar Jets Jumping Jets. The video below shows the design and construction of a Water Scenes fountain water feature. We designed both the pool and the fountain display as a focal point for a parterre garden. See our Home page for more info on Water Scenes. We also offer floating lake fountains for large water surface area aeration. Below is a Water Scenes fountain design project, it is still in test mode here and incomplete but demonstrates some of the possibilities.